Become a Library Student Ambassador! Hey undergrads! Looking for a summer job? Want to spread the love for UCF Libraries and get paid?!?! Apply to become a Library Student Ambassador! Mission: Student Library Ambassadors will raise awareness within the UCF community on library programming, resources and services available to students. Promote library events and programming to UCF students. Help the libraries increase engagement on their social media channels. Educate peers on library resources and services available to support their academic goals. Help the libraries develop programming that appeals to undergraduate students. Assist with content creation for UCF Libraries social channels, marketing materials, and other promotional activities. Conduct presentations and provide information about library events and services to small and large groups, such as student clubs, student organizations, and classes. Participate in campus tabling events, library events, and other library-related activities. Artist, Poet and Entertainer Joy Postle was one of Florida’s pioneering Naturalists, but perhaps is best known for her entertaining and educational stage shows titled “Glamor Birds” in which she would paint Florida’s birds while sharing bird songs, music and poetry. This exhibit highlights some of her bird painting and poetry. Stop by the John C. Hitt Library main floor to peruse or check out books about nature poetry to help celebrate National Poetry Month. Get inspired to write your own poetry or feel connected to the Earth by looking through our featured selections. You’ll find the nature poetry on the bottom two shelves of the display next to the bank of two elevators. Join Arboretum Staff for a fun and educational hands-on experience learning plant collection, and pressing techniques in our beautiful campus natural lands. This imPRESSive workshop will focus on the history, and value in preserving plant specimens for education and art! We will begin with a brief introduction, followed by our staff leading participants in a plant collection adventure, and ending with guiding you through plant pressing techniques that you can do on your own! You will be able to collect, press, and preserve your specimens then retrieve them from the library once they are dry! We look forward to seeing you in the woods! Stop by the John C. Hitt Library main floor to browse featured selections on Nature Writing. Come to read about how to write about nature, why we should protect our lands, and what benefits nature can add to our busy lives! Feel free to check out these books or enjoy them at the library. Join the Arboretum in celebrating Arbor Day! We will be hosting a fun-filled day of activities including a guided trail hike, and tree planting event in the Arboretum. Help us plant trees, and celebrate our beautiful campus natural lands! Nature pavilion activities will include FREE FOOD (please RSVP through Knight Connect), native Florida flora and fauna education, personalized tree ring “crafting” fun, seeding activities, and geocaching! See our flyer and social media outlets for activity times. See you in the woods! 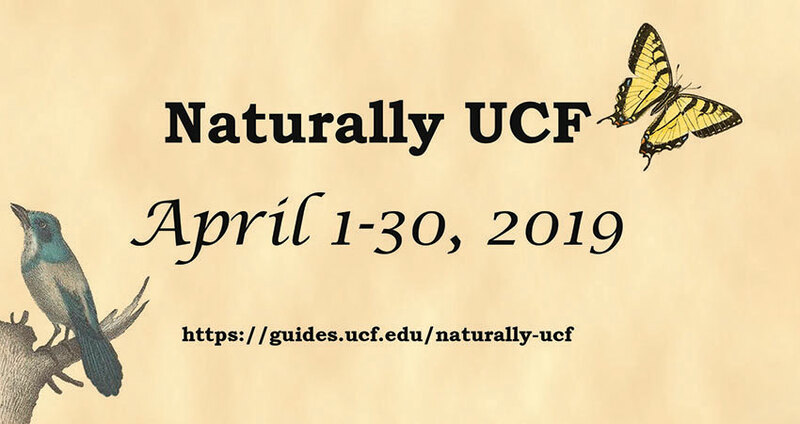 Come join us for a hands-on workshop at the UCF Nature Pavilion to observe nature in the flesh! Based on the book by David G. Haskell, “The Forest Unseen,” participants will head into the woods around the UCF Arboretum to observe a 1 meter square space. Participants are encouraged to utilize photography, sketching, or audio/video recordings to document their observations led by the guidance from a naturalist. Come find out about the natural history of our area and to produce a brief guidebook commemorating your experience. Come join Stetson University Associate Professor of Environmental Science and Studies and Faculty Director for the Institute of Water and Environmental Resilience, Dr. Jason Evans, on an engaging and thought provoking lecture and discussion regarding Central Florida’s plan for sea-level rise. Trained as a landscape and systems ecologist, most of Dr. Evan’s recent research has focused on climate change adaptation within coastal communities, with a particular focus on seal-level rise. Largely through research support provided through the National Oceanographic and Atmospheric Administration (NOAA), over the past several years he has conducted flood vulnerability assessments for numerous local governments in the southeast United States. Some of these communities include Monroe County, the Village of Islamorada, Satellite Beach, and New Smyrna Beach, FL; Tybee Island and St. Mary’s, GA; Hyde County, NC; and Beaufort, SC. Dr. Evans also serves as Co-Editor-in-Chief for the Journal of Environmental Management, a leading international publication within the fields of environmental science, engineering, and planning. Check out a pegasus today! Beginning April 1st, 2019, the library will need to close off access to all stairwells and elevators. But don’t worry! Thanks to a very generous funding grant and some morally dubious genetics work, the library is proud to offer a variety of pegasi for patrons to choose from. Each pegasus can be checked out for up to four hours with one renewal per day allowed. All the pegasi are well trained and can ferry patrons to any floor of the library and back down to the ground floor. Dismounting can be a little tricky though the ride is well worth it! But don’t take our word for it! Visit the library today and let us know what you think of the newest addition to our catalog! To create more study space in the library, we’ve been moving books from the library shelves to the ARC, our new storage facility. So how do you get books from the ARC? What if something is on the shelf, and you just want to pick it up at the circulation desk? What if it’s already checked out? We’ve created new videos to explain the process, and help you know when to expect your books to be ready for pick up.